In today’s political climate, U.S. mental health professionals face a challenging dilemma: Whether or not to alert their patients and the public about their views on President Trump’s dangerous state of mind. Stuck between a rock and a hard place, they ask themselves, Is someone a psychotherapist or a citizen first? Do practitioners and professors of psychology best serve society by remaining silent or by speaking out about their grave concerns for the public? What’s the difference between a mental health provider describing the behaviors of a public figure and diagnosing him or her? Authored by 27 contributors, all experts in the mental health field, this book answers these questions and many more. These “witnessing professionals” are comparable to those providing their views publicly in other areas of expertise—medicine, law, government, foreign relations or finance. In fact, psychiatrists and mental health professionals are often called upon to educate and enlighten our citizens on public health and safety issues—suicide prevention, violence reduction, substance abuse treatment, the nature of bias and prejudice, effective child-rearing practices, the life-long harm of childhood abuse and neglect, trauma resolution, and the deleterious effects of poverty on body and mind. The opinions of the book’s contributors are not based on what skeptics may call psychological mumbo jumbo. They are predicated on longstanding tenets of psychology, well researched and tested evaluation tools for the risk assessment of violence, psychopathy, and psychological pathology, historical study of presidential mental fitness and its lack thereof, and decades of professional experience. There is one central question being addressed here: Is President Trump a danger to the U.S. and the free world? Responses are based on assessment of presidential functionality and fitness rather than on diagnosis, and the book is less about Donald Trump than about how we came to elect him as President and what we must now do about it. So strong is the authors’ collective conviction that the president is a danger to our country and the world that they would apply the post-911 security directive, “If you see something, say something” to the need for preservation of what we cherish most dearly in our democratic society. 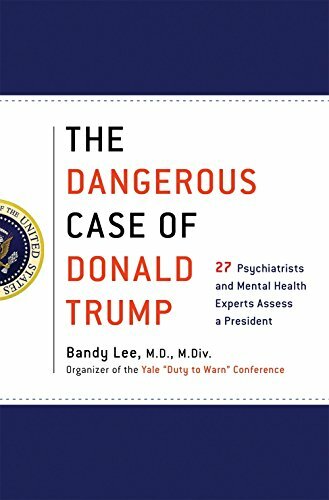 The Catch-22 faced by mental health providers is critical to understanding why more of them, even well-known experts, have not spoken out against the president and to the value of this book, whose authors dare to share their concerns. The dilemma for mental health professionals involves the Goldwater Rule of 1973 (aka section 7.3 of the American Psychiatrist Association code of ethics) and the Tarasoff Decision of 1976. The Goldwater Rule posits that “It is unethical for a psychiatrist to offer a professional opinion [on a public figure] unless he or she has conducted an examination and has been granted proper authorization for such a statement.” It governs psychiatrists only, with other mental health professions dictating similar standards about when diagnosis is and is not permissible. Tarasoff is a decision which says “that psychiatrists have a positive obligation to speak out publicly when they have determined, or should have determined, that an individual is dangerous to another person or persons, in order both to warn the potential victim(s) of the danger they are in and to set in motion a set of procedures that will help protect the potential victim(s).” The decision is based on observable behavior and, in this current case, professionals’ “duty to warn” is about the president’s myriad actions indicating a lack of fitness for duty. The book is divided into three parts. Section 1, The Trump Phenomenon, explores the president’s behavior in mental health terms. Section 2, The Trump Dilemma, explains the quandary for psychotherapists bound by two standards of practice that are equally compelling but at odds with each other. Section 3, The Trump Effect, expounds upon the harmful impact the president is having on society and its democratic future. Much of what is written here about the president already has been observed and stated publicly by others, mental health professionals and political pundits alike. Observations include the behavioral traits and patterns of: paranoia, hypomania, chronic lying, impulsivity, reactivity, entitlement, lack of empathy, exploitation of others, other-blaming, manipulation, impaired judgment, volatility, hedonism, bullying, narcissism, and sociopathy. The book speaks to multiple audiences. It is written for psychotherapists who shoulder the burden of treating the surge in emotional and traumatic spillover since the 2016 election and who have been dealing with secondary trauma because of it. It validates what they are seeing not only in their traumatized and abused patients, but in what is being experienced by the general populace: helplessness, insomnia, emotional paralysis, heightened anxiety, vulnerability, shock, and a sense of unreality. Several of the book’s experts write from the vantage point of having conducted in-depth study of or having worked closely with Donald Trump and, therefore, are able to offer insights into the president’s behavior that psychotherapists may not have read about previously. For the general public, including students of history, sociology, and political science, there are chapters that examine the age-old, universal components of tyranny, the psychopathology of Donald Trump’s constituent disciples and the politicians who support him, and the chilling interactions between both groups and their president. These chapters will help readers make sense of their surreal experience of Donald Trump’s ascent to this country’s highest office and provide a better understanding of the unconscious psychological underpinnings, “collective emotions,” and self-serving dynamics between him and his followers. This highly insightful, thoughtful and enlightening book suffers from two defects. One is the amount of repetitive material among its chapters which detracts from, rather than adds to, the salient points being made. The other is that, considering the breadth and depth of what is covered by its numerous authors, readers would have benefitted enormously from a detailed index at the end of the book. These minor detractions aside, it is heartening to see notables in a noble profession leading the way for their peers and for this country’s citizenry.